Below is the basic lineup of the most popular models that Johnson Fabrication manufactures. Any of these units can be modified. 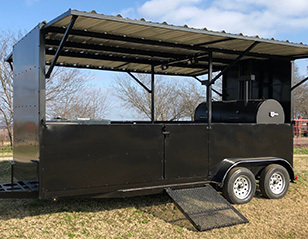 Vertical smokers and charcoal grills can be added or taken away, and trailer sizes and layouts can be altered. 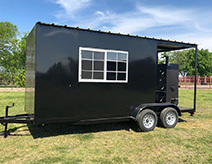 If you have any questions about custom designs, options, trailer layout changes, or are ready to order, please contact us at 972-921-0123. We will gladly meet your needs. NOTE: We maintain the right to make modifications to our products to enhance their cooking abilities and performance.